And you will understand the biggest pain in derby. Not the hip checks, the back blocks, the falling, the broken tailbones... it's the fact that you can never wear sandals with utter confidence again. That is my right (pusher) foot, on the side. And yes, it IS an actual wound, that has bled, glad you asked! 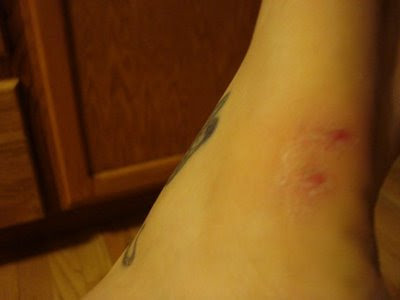 I peeled my sock off Monday night and noticed it was stuck to my foot more than usual and discovered blood! Now, I've never had the sexiest feet by any means. They're kind of big, and I have weird toes. But I was okay with my feet. I liked sandals and strappy shoes! But these days I'm definitely more of a socks and boots kind of gal. It's not just the gross bleeding wound, I now have huge callouses all over my feet, and what my husband lovingly refers to as my "sixth toe". No idea what it is, but it feels like an extra bone is trying to grow out of the side of my foot. This is a pretty common complaint among derby gals. Toenails fall off (if you have a strong stomach, check out the injury gallery on www.naptownrollergirls.com), the aforementioned callouses, which crop up all over the foot, extra dry skin.. the feet just become GROSS, for lack of a better word! Which means no more strappy high heels and slingbacks or sandals for me. I could do a whole other blog post about the difficulty in zipping up my fave pairs of knee high boots thanks to derby calves.. but I won't. It's too depressing. I just discovered your blog so I know I'm replying to this a bit late but the 6th toe thing is probably a bunion!